At Roanoke Landing Rehabilitation & Nursing Center, we’re not just another facility offering rehabilitative and skilled nursing care services. We are a team of uniquely qualified professionals, carefully recruited and hired for our nursing care and therapeutic talents. Our skills reach far beyond the stringent requirements of being well-qualified health care professionals; we’re responsive to the needs of our patients and their families—trustworthy in our approach and committed to quality care. Unlocking the human potential and raising spirits are the focus of Roanoke Landing Rehabilitation & Nursing Center therapy programs. There is a side of therapy which has nothing to do with muscle coordination or retraining the brain to do daily tasks or communication skills. It’s the human side of therapy—the side of therapy that gives people hope, making them believe they can perform activities which they might have thought were never again possible. It’s all about recovery and a sense of personal accomplishment. We invite you to come by and visit. Take a tour and see why life at Roanoke Landing Rehabilitation & Nursing Center is an experience to enjoy. 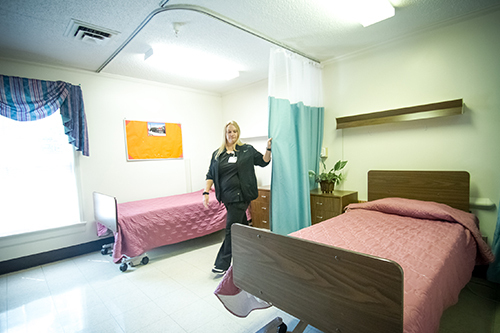 A special part of Roanoke Landing Rehabilitation & Nursing Center is our short stay rehabilitation program which is designed to prepare the resident to return home at the earliest possible date. Whether your stay is long term or short term, Roanoke Landing Rehabilitation & Nursing Center meets each of our patients’ medical needs, while maintaining independence and dignity. Roanoke Landing has many wonderful characteristics and amenities that make it extremely appealing to individuals living in Plymouth, Edenton, and the surrounding Washington-Chowan County area. We’re a smaller facility, so we are able to get to know each patient and resident and provide more meaningful, intimate care. Located just at 1084 US 64 East in Plymouth, North Carolina, we are a 123-bed facility with semi-private and private rooms. Large activity rooms provide great spaces for family gatherings and socializing with residents. A large dining room and full service kitchen ensures residents enjoy quality, nutritional meals. We pride ourselves on being as accommodating as possible for our residents regardless of their mobility. We provide transportation services to and from doctor’s appointments for all of our residents. Wheelchair and stretcher transports are available for doctor’s appointments as well as planned activity outings. Non-emergency transports are provided by Coastal Medical Transport, Roanoke Medical Transport, and Bertie Ambulance BAS. Emergency transports and all in-county transports are provided by Washington County Emergency Medical Services. 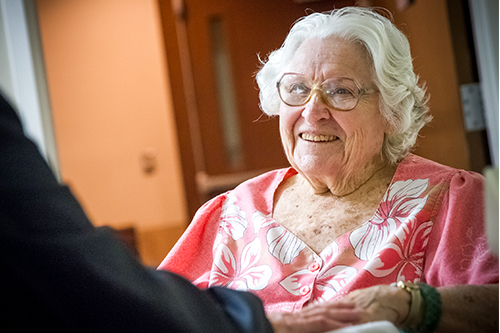 While Roanoke Landing proudly offers a wide range of amenities and home comforts, one of the most important things to consider when choosing a long-term care facility is the staff’s interaction with patients. Our staff knows all of our patients by name and are familiar with all of their habits. It’s one of the advantages of a smaller facility such as ours: intimate care and deep personal relationships with our staff. Our primary purpose is to provide unmatched rehabilitative and long-term care for our patients and residents, never to win awards. However, we are occasionally recognized for our excellence in the field. It takes a staff of caring, skilled professionals working together to gain this sort of recognition, and we are honored to have such an outstanding staff. Bronze—Commitment to Quality applicants begin their quality journey by developing an organizational profile including vision and mission statements, an awareness of their environment and customers’ expectations, and a demonstration of their ability to improve a process. 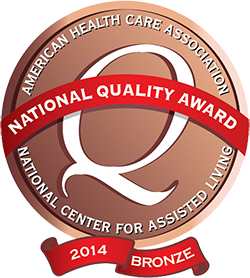 Find us listed in US News and World Report’s Best Nursing Homes in America for 2014 and 2015. 5 Stars–from the Centers for Medicare and Medicaid Services in 2014. We are proud to have received the highest rating–5 Stars—from the Centers for Medicare and Medicaid Services in 2014.